Although I’ve never met the American novelist Julianna Baggott, she has championed my work from afar and blurbed my most recent novel, The Rising of Bella Casey, enthusiastically. Here’s a blog she wrote about discovering a hardback US edition of my first novel, Mother of Pearl, by fluke in a New England campground. A lucky coincidence, as it happens, and not the first time it’s happened. 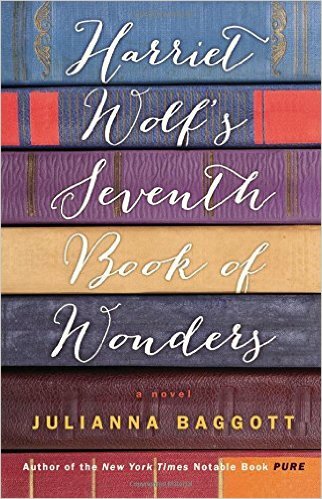 She generously credits Mother of Pearl with influencing the writing of her recently published novel, Harriet Wolf’s Seventh Book of Wonders, which for any writer is a great tribute. Julianna’s done me another favour by introducing me to the AGNI blog, where this post first appeared. It’s a site that boasts an eclectic mix of writerly concerns, founded as a magazine way back in the 1970s. I’m now an avid follower. Meanwhile, I’m glad to report that both Mother of Pearl and The Pretender will shortly be available as e-books and in print on demand editions from Jonathan Cape. My relationship with Mary Morrissy’s little-known debut novel, Mother of Pearl, is starting to feel like a love affair—a chance meeting, a lost love, then we find each other again. Or perhaps, I could put it more simply: girl finds book; girl loses book; girl gets book back again when she least expects it. Morrissy’s novel first found me completely by chance, following me home from a London book-tour. This weekend, fourteen years later, it found me again by chance in a campground rec hall in North Egremont, Massachusetts. This is how it began. In 2001, I was on tour for my first novel, giving an interview at a London publishing house. My husband Dave was with me and, while I answered questions, Dave was left to wander around and take any book he liked. The offices were lined with bookshelves with thousands of books on display. My interview went long, and when I found Dave again, he had taken a ridiculous amount of books. I would have been embarrassed by his greed at a New York City publishing house, but was completely humiliated among the ever-polite British editors who seemed nervously bemused by the situation. Dave was beaming. As we left, I let off steam and then eventually asked the obvious: how the hell are you going to pack all of these books and get them home? I remember watching, for the first time, the British television show The Weakest Link, while, as a point of pride, Dave shoved every last book into our suitcases, which we hauled around for another week or so. Once home, it took me a while to warm up to the books. But, eventually, I looked through them. One, in particular, caught my attention—Mary Morrissy’s Mother of Pearl. There are a bunch of novels with this title, including one Oprah pick, but to get to Morrissy’s Mother of Pearl on Amazon, you have to misspell her name, Morrissey. It was not widely circulated. It didn’t receive broad review attention in the U.S.. It didn’t pop up on any bestsellers lists. I loved the first sentence. “It had started as a shadow as Irene Rivers’ lung.” Then I disliked a word in the first paragraph (cheekily—she was describing the wind). I was a very picky reader back then, harsher than I am now, and almost put the book down. But I kept going and I loved every word thereafter. In fact, Morrissy’s Mother of Pearl became one of the most important books I’ve ever read. It formed my foundation as a novelist. A half dozen years later, I was teaching a novel seminar to graduate students and assigned the book. The students quickly brought to my attention that it was out of print and very hard to find. I held tight to my sole paperback, which by now was dog-eared and underlined madly. I started mentioning Morrissy’s novel to my editors along the way, hoping one would want to reprint it. When I heard of presses doing reprints, I’d mention the novel to them. Eventually, I decided to track down Morrissy herself. I found her on LinkedIn in 2010. I never use LinkedIn, by the way, but she wrote me back the next day. “Many thanks for your message—so YOU are my reader out there!” We corresponded some in 2010. I was urging her to get the book in print again and connecting her here and there along the way. Again, we connected in 2013 and I blurbed her new novel, The Rising of Bella Casey. This past weekend, I found myself in an old New England rec hall at a campground. All four of my kids were with me and Dave and my folks. Amid the chewed up ping pong table and the whirring air hockey, there were a few shelves of used books. I headed over to them just to see what was there; I love the strange stain left from random collections. As I was looking through, I saw Mother of Pearl written on a dark binding. It couldn’t be Morrissy’s book. Not possible. I pulled it out and found that it was, in fact, her book in hardback, which I’d never seen before. It was wrapped in a library-use protective jacket and had once been part of the Ardsley Public Library’s collection then seemingly sold off, it became part of the BookCrossing.com program, which encourages people to label then let loose a book into the wilds after which they can follow it, virtually, wherever it goes. On Tuesday March 10th, 2009, someone from Wingdale, New York, set Mother of Pearl free and, one way or another, this copy landed with me, possibly the most ardent Mary Morrissy fan in the country. I’m not one to over-hype coincidence, to read life’s quirkiness as signs from the universe, but this feels like an opportunity to take stock. Now, with some distance, I can see why Morrissy’s debut novel was so important and influential to me. Mother-daughter relationships are enduring themes in my work and the obsessive theme in Mother of Pearl. Her novel opens in an Irish sanatorium in 1947, a place Irene refuses to leave because of her fear of the outside world even after she’s cured of tuberculosis. And it is my most recent novel, which I started working on eighteen years ago, Harriet Wolf’s 7th Book of Wonders, that is the most closely tied to Mother of Pearl. Opening in 1900, my main character, Harriet Wolf, grows up in a place that was known as The Maryland School for Feeble-minded Children and spends some time in the psychiatric hospital, Sheppard Pratt. After an illustrious career as a novelist, she becomes a recluse once again later in life, and her granddaughter, Tilton, also lives in fear of the outside world, much like Irene. However, the more important influence of Morrissy’s novel happens line by line. Morrissy’s language is what moved me. Her vocabulary is unapologetically rich. And the beauty in her most brutal imagery is something I’ve strived for in so many of my novels. I’ve never been able to come close to her ability to expose the vivid interior imaginations of her characters, the worlds within that go unexpressed. Now looking at this pristine copy—free from the marginalia of the earlier versions of my writerly self—I get to sit down with this novel again, hoping that I’m stirred anew while rediscovering what once tethered me more tightly to my craft. I begin again with a shadow on a lung.